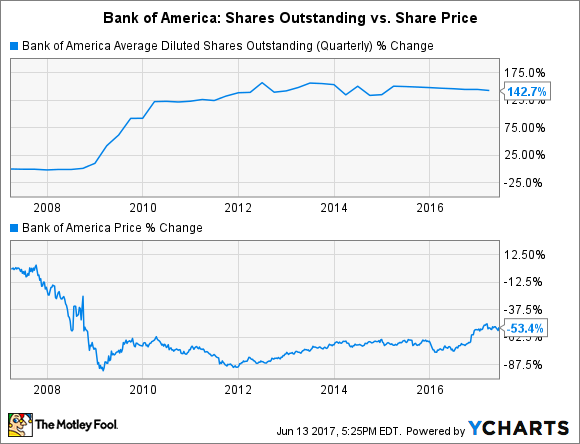 Will Bank of America Raise Its Dividend on June 30? It seems highly likely that Bank of America will soon boost its quarterly payout. Shareholders of Bank of America (NYSE:BAC) could soon learn whether the nation's second-biggest bank by assets will raise its dividend. The date to watch is June 30. That's when the Federal Reserve will release results from the 2017 Comprehensive Capital Analysis and Review process, or CCAR, in which banks request regulatory approval to increase the amount of capital they return to shareholders. Banks are unlike any other type of company when it comes to returning capital to shareholders. A manufacturing or retail company can do so at the discretion of its board of directors. But this isn't the case when it comes to banks. Under the Dodd-Frank Act of 2010, the nation's biggest banks must request permission from the Fed before doing so. This rule may seem overly restrictive, but there are compelling historical precedents for its existence. In fact, Bank of America offers a case in point. In the years leading up to the financial crisis, the Charlotte, North Carolina-based bank repurchased 768 million shares of its common stock at an average price of $52 per share. All told, that equates to a grand total of just under $40 billion. The problem was that this left Bank of America undercapitalized when the crisis struck. To raise new capital, in turn, the bank had to issue 3.5 billion new shares in 2009 at an average price of only $13.47. By effectively buying high and selling low like this, Bank of America diluted the stake of existing shareholders, which explains why its shares are still more than 50% below their pre-crisis peak. BAC Average Diluted Shares Outstanding (Quarterly) data by YCharts. Fortunately, the situation couldn't be more different today. It's no exaggeration to say that Bank of America has an overabundance of capital. As I wrote at the end of last year, no other bank has more capital. By my estimate, it could return as much as $23 billion on buybacks today and still sail through the stress tests and be considered well capitalized for regulatory purposes. With this in mind, it makes sense that returning capital is one of Bank of America's highest priorities. CEO Brian Moynihan has discussed this on multiple occasions in the past, going all the way back to 2011. And he doubled down on this commitment in his 2016 shareholder letter, which you can find at the beginning of the bank's annual report. Moynihan began his latest letter by noting that Bank of America returned $6.6 billion in capital to shareholders through a higher dividend and share repurchases last year. He then reinforced multiple times that the bank is "focused on reducing the dilution and increase the dividend." The good news for Bank of America shareholders is that it's likely on the verge of following through on this vow. According to an analysis by analysts at KBW, the $2.2 trillion bank is expected to boost its quarterly dividend by a third, going from $0.075 per share now up to $0.10 per share. Bank of America still has a lot of ground to make up when it comes to the size of its dividend relative to other banks, many of which have boosted their quarterly payouts every year since 2010, but rest assured that it's well on its way to closing the gap.